Do You Have To, or Do You Get To? How you perceive the different aspects of your life will have a massive impact on how much enthusiasm you bring to each of them. If you see things as an unfortunate duty, you will dread doing them, avoid them and probably not do a very good job of them. Conversely, if you see your activities as a privilege and an opportunity to do your best work, you will have more passion, more energy and become much more effective. It’s the difference between feeling as though you have to so something, or feeling as though you get to do something. This week, we lost a truly remarkable woman. 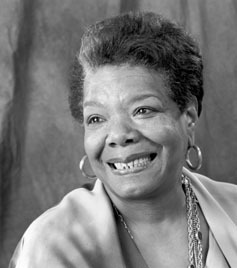 Maya Angelou was a wonderful poet, writer, activist and singer. Her singing and speaking voice had such richness and she shared such wisdom that I could listen to her for hours. She didn’t have an easy upbringing, but over her 86 years, Maya was able to forgive, love and create wonderful art. And while she did so, she encouraged us all to forgive, love and create wonderful art as well. It’s easy to come up with excuses for not charging after your dreams now. I’ll wait until the kids are older. The economy needs to stabilise first. I don’t need to start now, I’ve still got time on my side. I need to be more sure about the future. Seinfeld is my all-time favourite TV show and the tales of Jerry Seinfeld’s work ethic are legendary. His response was that the way to be a better comic was to create better jokes and the way to create better jokes was to write every day. Jerry told him to get a big wall calendar that has a whole year on one page and hang it on a prominent wall. The next step was to get a big red magic marker. He said for each day that he sits down to write he gets to put a big red X over that day. If you want to do something remarkable with your life, you can almost guarantee that there will be people who will judge you. They will criticise you and question you. They will tell you what you need to do better. They will call you crazy, loopy, a heretic. They will sit in the cheap seats and insult you. Alternatively, you could do nothing. I’m a sucker for a great commencement speech and was delighted when I stumbled across this speech given by U.S. Navy Admiral Bill McRaven to his alma mater, the University of Texas. He spoke about a range of great principles, including the necessity of making your bed each day (I’ll be sharing this with my kids), judging others by the size of their heart, the value of hard work and never giving up, but it was this story from his Navy SEAL training many years ago that I wanted to share with you. The ninth week of training is referred to as “Hell Week.” It is six days of no sleep, constant physical and mental harassment and — one special day at the Mud Flats — the Mud Flats are area between San Diego and Tijuana where the water runs off and creates the Tijuana slue’s — a swampy patch of terrain where the mud will engulf you. Every now and then, I meet seemingly ordinary people who are doing genuinely amazing things with their lives. This week, I had the privilege of meeting Natalie and Warwick, the sister and brother-in-law of a good friend of mine. I had heard a lot about them and it was terrific to meet them for the first time and hear their story in person. After studying agriculture in a nice Melbourne university, Natalie and Warwick weren’t sure about what to do with their lives. After trying a few things, they felt called and compelled to go to the African nation of Niger. Niger is one of the poorest countries in the world. 80% of the land is desert and it has the highest birth rate in the world. The country has been ravaged by poor land management for generations and these guys have been able to utilise their training and expertise to teach local people more sustainable farming techniques, better ways of looking after the land and how to re-forest areas to claim back the desert. Should Your Child Start a Blog? A couple of weeks ago, my oldest son, 9 year-old Hayden, came home from school and told me about his friend Katie’s blog. Hayden knows all about this site, but it was the first time that he had talked about having his own. “What would you want to write about?” I asked him and we had a chat about a few options. Eventually, Hayden decided on an animal blog, where he could describe 5 interesting facts about a particular species so that he could help school kids to learn about animals. That Friday night, we set up a new WordPress blog for him and Hayden’s Animal Facts was born. It was a very profound statement for a 9 year-old. Here’s the thing. You’re not a tree! If you don’t like your current situation, make a change. If you don’t like your current job, get a different one.